Whew, the end of this week was crazy! Our house had to wait a few days, before it saw some attention again. Yesterday Cason started his new job! yay! And I'm gonna try to see if I can at least PRIME this yellow bathroom today! Pray for a LOOOONG nap for my girls today. lol. I'm definitely going for more of this look, in here now, for the girls.... we'll see how close I can get. With what I have to work with. 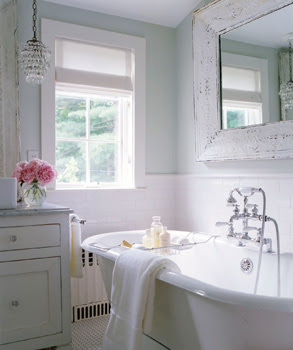 I just love these chic bathrooms!! And I want the girls to actually HAVE a bathroom as their own now. Before it was just kind of a hall bathroom, that rarely got much use. Love the color of your bathroom with the stars. What is the color and name brand of the paint?